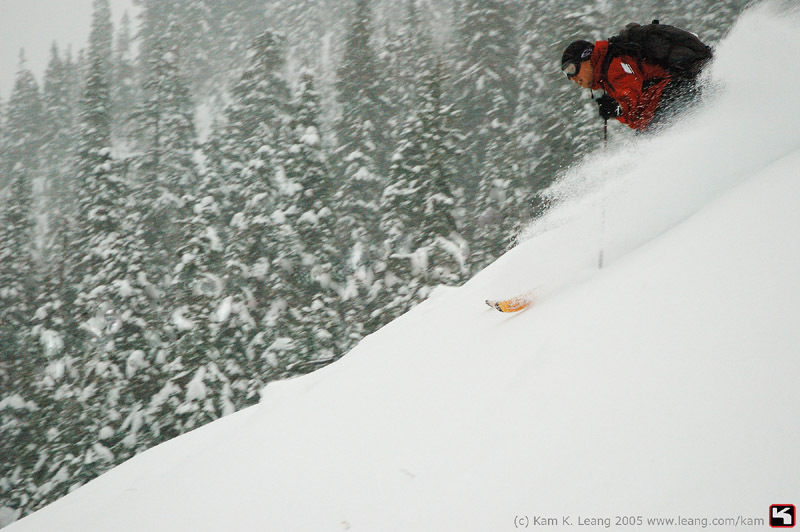 When Turns-All-Year regular Kam Leang (yes, Chinese rule the backcountry) put up a post of a dawn patrol at Alpental for the second week in a row, I jumped at the chance to . . . well, think about it. The prospect of getting up at 4:45 AM was not a pleasant one for a night person like myself, and the early morning runs to Rainier earlier in the year had left me reeling. When decision time came around, however, I decided to throw my hat in the ring and make an appearance. Pulling into the main Alpental lot at 6:30, Kam, Cascadesfreak, and jimjar were already getting their boots on, and I hustled over to say hi to them, dropping my car key into three inches of rapidly accumulating graupel as I exited the Audi. I strapped on the Barryvox and headlamp, donned a coat, and affixed skins to skis before realizing this as I went to lock the car. 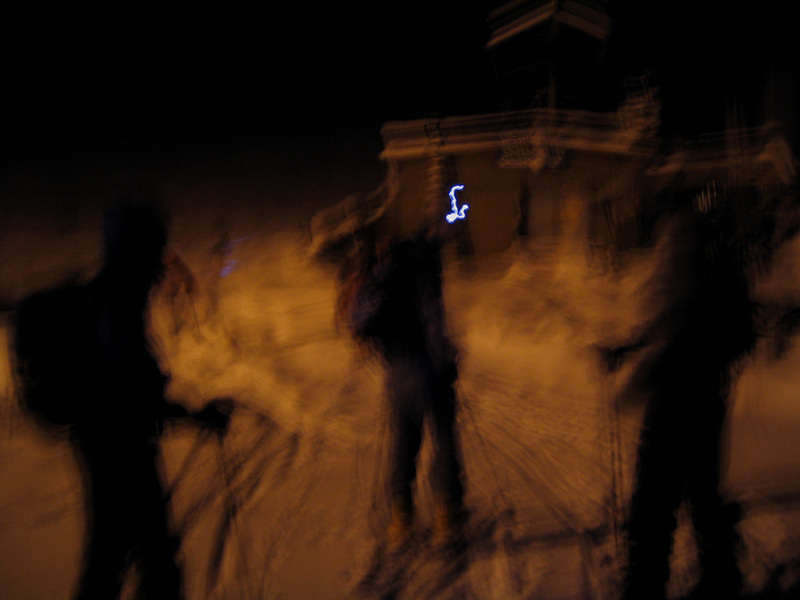 The crew of eight spread out to search the area to no avail, so I told them to head on up and I would catch them - fortunately, I soon found the key right next to my front door and caught the rest at the base of Sessel chair. Breaking trail in mixed pow and windpack was vigorous but not oppressively so; Kam lead off and was followed by Chris and Jim. Michael (from France) and Baldwin (who had recently moved from Montana) powered along just behind me. 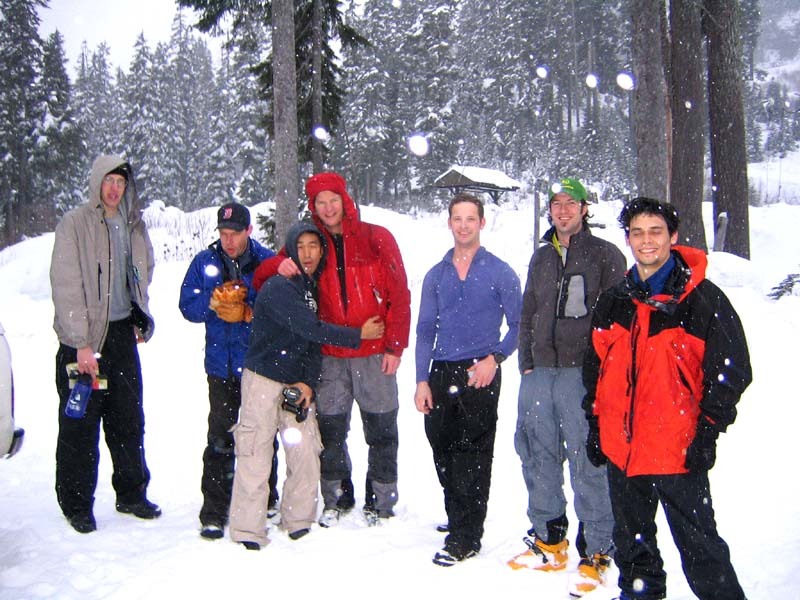 The group, which included some TAYers I had not previously met, also included mej, mjt, Charlie and Jeremy and was pretty much equally divided between AT skiers, tele skiers, and snowboarders. As we reached the flat in the middle of the Edelweiss valley, Kam and some of the others who had a work deadline to adhere to (meaning they had to get back to Seattle to BE there) yelled up that it was nearly time to head down - meanwhile, several in the group had decided to dig pits and found the rapidly growing layer of fresh becoming more and more slabby, with some people also hearing evidence of snowpack settlement. 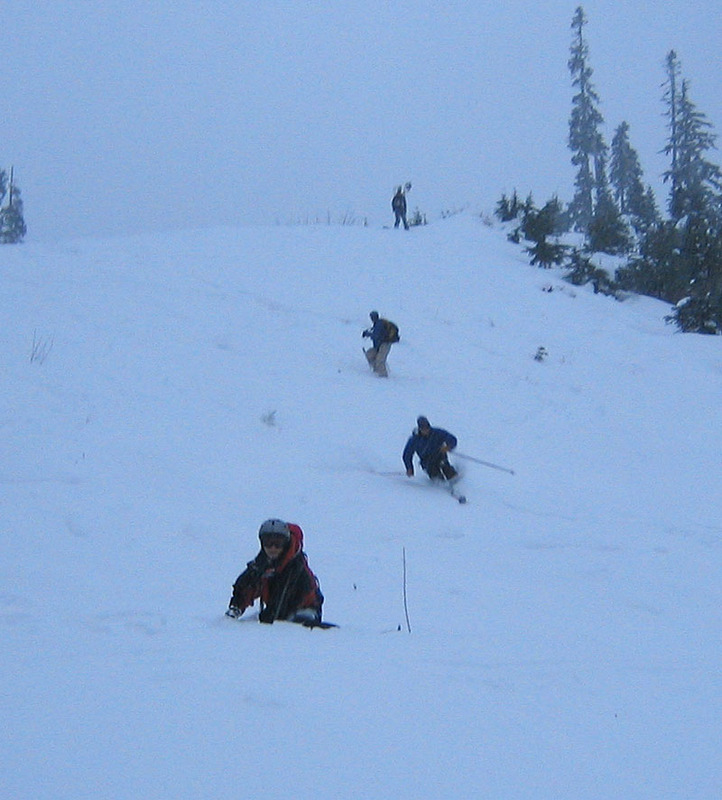 We decided to turn around after ascending about 1,900 vertical feet, and enjoyed some quality turns on the way down. All in all, a tremendous way to start the day, as well as meet some new friends from the forums! Following the dawn patrol descent, I headed over to Kevin's house for breakfast and tea - he had just gotten off work at 7:00 and was ready for a day of skiing. After telling of his tour two days before around the Hyak vicinity and admitting that the turns were less than thrilling, we decided to go back over to Alpental especially, I assured him, since there was already a good uptrack to follow. This turned out to be only partially true - the combination of heavy snow and wind had already laid down between three and four inches of snow, partially obscuring the skin track from three hours previous. Kevin and I headed up past the point we had reached in the early trip, through the narrow drainage and up onto the top Edelweiss face. We were feeling good and on pretty much the same uphill route we had followed the previous Saturday, when suddenly we noticed radiating cracks in the snow with each uphill skin step. Almost immediately, and in short succession, we heard two distinct and LOUD "whoomphs" as the snowpack settled - not the sound you want to hear when you're standing on a 35º slope with a foot of fresh and several hoar layers lower down . . .
As gingerly as possible we turned around, and with skins still on, descended to a less steep part of the slope, then quickly de-skinned and beat it back down Edelweiss. We decided to call it a day as we reached the Alpental parking lot, and I wished Kevin good snow on his upcoming trip to Canada . . .
Epilogue: Shortly after returning home, I received an e-mail from Kevin saying that rumors were flying at the Summit about an avalanche at Alpental around 12:30, apparently on the International side. The victim had been dug out by his partner, and members of the Alpental pro patrol, who were mostly on the job despite the area being closed, were attempting CPR. Later news reports on network TV and in the press confirmed the avalanche, along with the sad news that an Alpental local named Erik Lewis had died as a result of injuries suffered in the slide after being air-lifted to Harborview Hospital in Seattle. Bringing the news even closer to home was the realization that this was the same Erik that Kevin and I had spoken to in the Stevens Pass parking lot just a few weeks prior to this . . .